Today in the USA, it is known as Veteran's Day; however, when I was but a wee lad on the lap of my Grandfather Baker, a WWI Vet, it was known as Armistice Day. 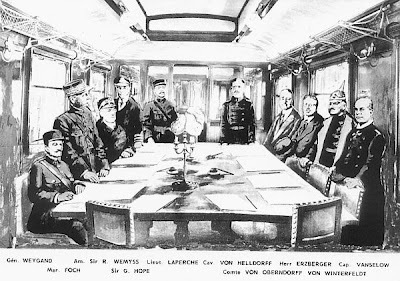 Today, the 11th day of the 11th month, on the 11th hour, the Armistice was signed in a railroad car to cease "The War to End All Wars". A bold, and later on, a false claim. That very same railroad car was the scene of the surrender of France to Germany in WWII. I didn't get my Grandfather Baker to talk too much about his experience in the trenches in the Argon Forest. 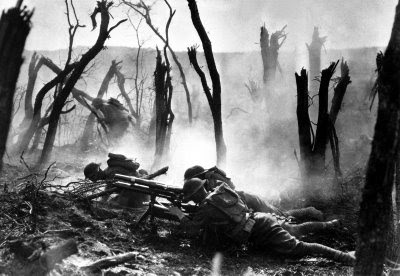 As a history buff, I read of the horrific accounts: rats feasting on the dead next to you but you can't move for risk of death, the mustard gas attacks, hours of shelling, running across the killing zone, etc. His first story was about an Italian soldier who shared the same trench next to my G-Dad's unit. His name was Luigi, and he had a golden tooth that shined when he smiled. My Grandfather saw Luigi get shot in the head. 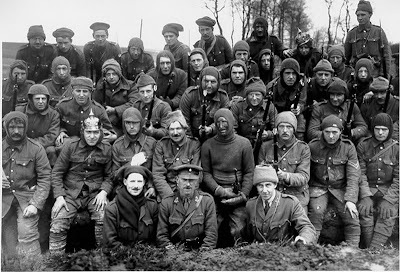 The second story was how at 11am on 11/11/1918 the troops once again heard the whistle to climb the trenches and advance across the killing zone known as "No Mans Land"...but this time it was to greet the enemy and celebrate the fact that they were now the lucky few survivors of a truly horrific war. Germans, English, French, Belgians, Poles, Italians, all hugging, crying, laughing, drinking, smoking and showing pictures of their loved ones to each other. Simply celebrating life and being alive! He said it was the best day of his life! 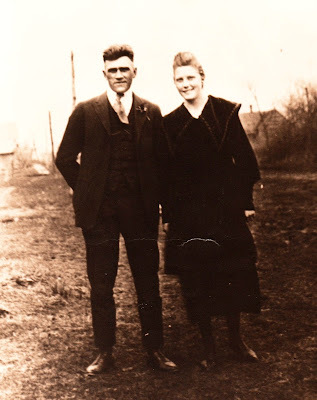 John Thomas Baker married Edna Lilly Tunnel (My Grandparents) a year later in 1919. This is their wedding picture outside the homelands of Sims, Illinois. So today, remember all who have died for, or served your country, and on the 11th hour raise a toast to those who are no longer, the survivors of the War to End All Wars. My Grandpa Kuhn was a WWI vet. He, like many others, came back home and never spoke about it. Sir Bowie "who agrees with Albert Einstein:I know not with what weapons World War III will be fought, but World War IV will be fought with sticks and stones"
A salute today to Pvt Richard D Courtney Sr.....who went to be with our Good Lord last March 22....and to your father Bud....and grandfather John T Baker....who served our country proudly in WW I and WW II. I also pray for the families who senselessly lost their loved ones in the attack at Ft Hood last Thursday. A scared trust was broken when an Army psychiatrist was mowing down innocent servicemen who in many cases were preparing for depolyment to Afghanistan....soldiers expect to be safe and protected on their OWN bases! 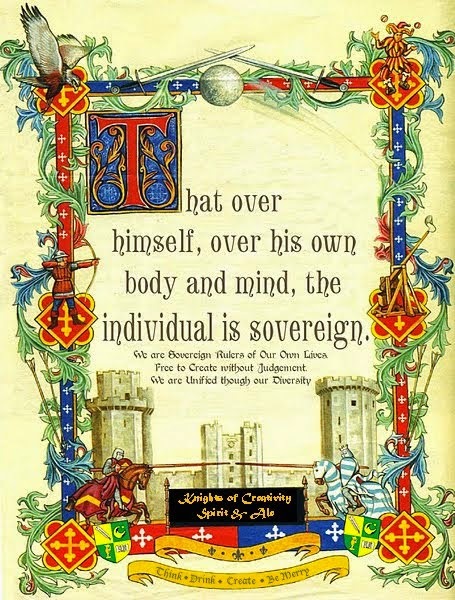 Fine Blog for a fine sombre day in the UK. It is still called Armistice Day here, and we had Rememberance Sunday ( Poppy Day ) here last Sunday, which is always ironic considering the poppies in Afghanistan. and great-grandpap Keep -from the Boer War... all shone, their undfading colors in the winter sunlight that beamed through the parlor window onto their case-frames. They fought so we could still moan about the weather in English and not german. Yes Sir David.....much rather hear your British accent than Her German!! Hip Hooray for all the Brits who kept the Isles.....free!...and to complain about the weather! Sir Richard.....from across the Pond...and Beaver Creek! 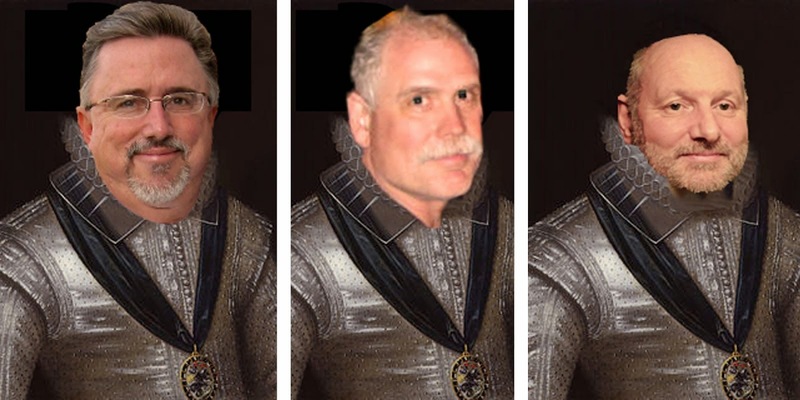 Ah, Sir Hook, Sir John of the Rangeline am I, and also a grandson of John T. I must confess jealously, for you were the one to live close to the noble, Elder Baker, and you were the one to hear of his stories, not me. Lady sister Tenae and I, however, have come to possess a box full of some of his and his dear Edna's WWI paperwork, and I'll tell thee here one brief story. John T served in WWI, but it wasn't for a full deployment, as I'm sure you know; upon his return, he sought to blame the US Army for most all of his physical ills. In one back and forth series of correspondence with the Army he tried to get US tax dollars to pay for medical treatment for his "arthritis of the liver." Yes, thou readest correctly, "arthritis of the liver." To this the US Army doctor replied in writing saying, good try, Private, but "there is no such animal." I smiled. My hat is off to our active duty military; my hat is raised, too, to our veterans of wars recent and past. And I would very much have delighted to join you, Sir Hook, in hearing some of John T's tales. My hunch is that we would have had to strive mightily to discern the truths in the narratives told us. We might also have laughed out loud from time to time. Glad to think of thee today and the generational rock from whence we both were hewn.